The product owner and the ScrumMaster are two separate agile roles that complement each other. To do a great job, product owners need a strong ScrumMaster at their side. Unfortunately, I find that there is often a lack of ScrumMasters who can support the product owner. Sometimes there is confusion between the roles, or there is no ScrumMaster at all. This post explains the differences between the two roles, what product owners should expect from their ScrumMaster, and what the ScrumMasters are likely to expect from them. The product owner and ScrumMaster are two different roles that complement each other. If one is not played properly, the other suffers. As the product owner, you are responsible for the product success — for creating a product that does a great job for the users and customers and that meets its business goals. You therefore interact with users and customers as well as the internal stakeholders, the development team and ScrumMaster, as the following diagram shows. 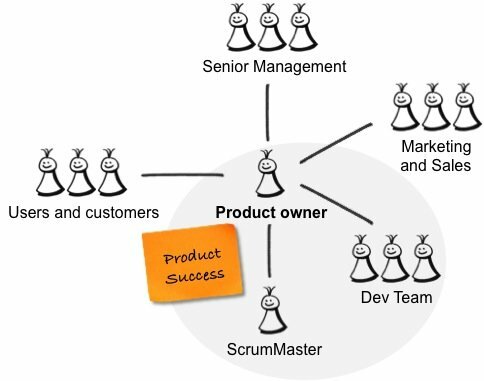 The grey circle in the picture above describes the Scrum Team consisting of the product owner, the ScrumMaster and the cross-functional development team. Succeeding as a product owner requires the right skill set, time, effort, and focus. So does playing the ScrumMaster role. Combining both roles – even partially – is not only very challenging but means that some duties are neglected. If you are the product owner, then stay clear of the ScrumMaster duties! Help the team collaborate effectively and manage their work successfully so that they can make realistic commitments and create product increments reliably. 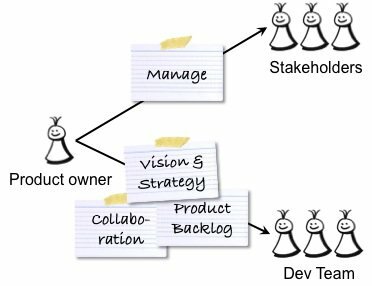 Encourage the team to work with the product owner on the product backlog. Ensure that the team has a productive work environment. Work with senior management, HR and other business groups to implement the necessary organisational changes required by Scrum. Educate the stakeholders about what’s new and different in Scrum, explain their role in the agile process, and generate support and buy-in. Resolve role conflicts such as product owner vs. product manager and product owner vs. project manager. Help the product owner choose the right agile product management techniques and tools. Support the product owner in making product decisions and tackle product owner empowerment issues. Help establish agile product management practices in the enterprise. The ScrumMaster supports you as the product owner so that you can focus on your job – making sure that the right product with the right user experience (UX) and the right features is created. If your ScrumMaster does not or cannot provide this support, then talk to the individual, and find out what’s wrong. Don’t jump in and take over the ScrumMaster’s job. If you don’t have a ScrumMaster, show the list above to your senior management sponsor or to your boss to explain why you need a qualified ScrumMaster at your side. Provide a vision to the team that describes where the product is heading. Communicate the market, the value proposition and the business goals of the product. Formulate a product or release goal for the near to mid term. Proactively work on the product backlog. Update it with new insights and and ensure that there are enough ready items. Provide direction and make prioritisation calls. Invite the right people and choose the right techniques to collect feedback and data, for instance, invite selected users the review meeting and carry out a usability test. Be available for questions and spend time with the team. Buy into the process and attend the sprint meetings. Manage the stakeholders and make tough decisions; say no to some ideas and requests. You can find more a more comprehensive description of the product owner duties in my post “The Product Owner Responsibilities“. 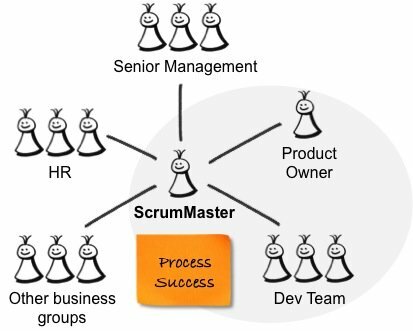 Reference: Every Great Product Owner Needs a Great ScrumMaster from our JCG partner Roman Pichler at the Pichler’s blog blog.